Luftwaffe Typhoon 31+00 (GS077), known as ‘Ghost Tiger’, won the Best Painted Tiger Aircraft accolade at the annual Tiger Meet. The Tiger Trophies are hotly-contested each year, and have been since the Tiger Meet originally launched in 1961. It was the Ghost Tiger’s distinctive design which stood out to the judges, displaying green and black striped markings across the entire top of the Typhoon, covering the wings, tail and body. 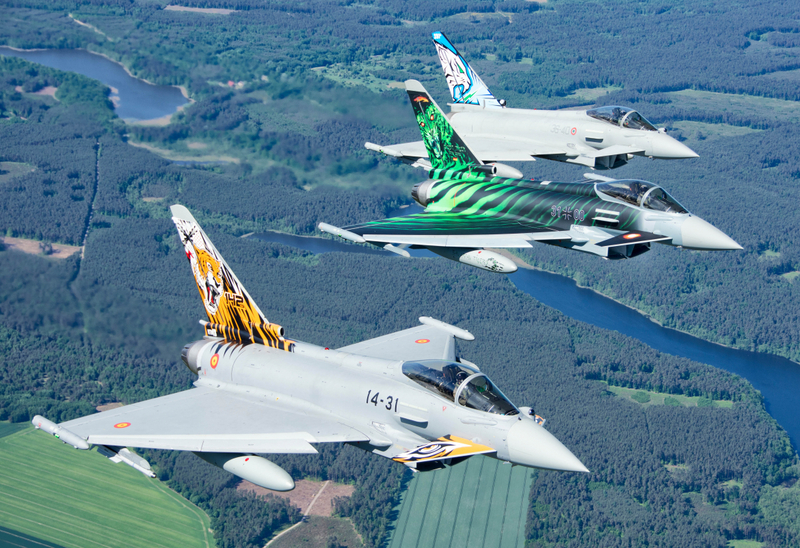 During the two weeks of exercise at the NATO Tiger Meet 2018 (NTM18), the Eurofighter community was represented by Italy, Germany and Spain. The Italian Air Force was present with four Typhoons from the 12°Gruppo at Gioia del Colle Air Base. Four Typhoons from Tactical Air Wing 74 in Neuburg were in attendance from the German Air Force and the Spanish Air Force participated with four Typhoons from 142 Escuadrón – Albacete Air Base. 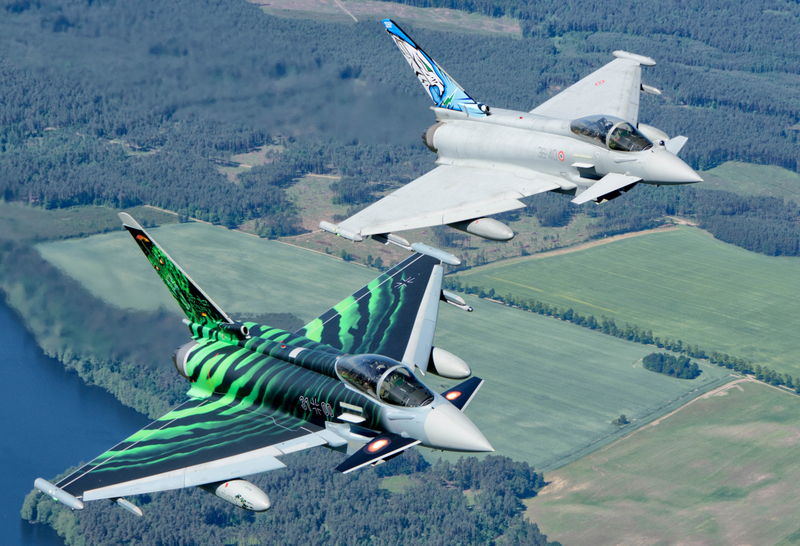 The Tiger Typhoons from these three Eurofighter nations successfully conducted complex Composite Air Operations, focusing their training in several types of missions. These included the implementation of a No-Fly zone, the defence and the attack of HVAA (High Valuable Airborne Assets), DCA Defensive Counter Air, OCA Offensive Counter Air, Personnel Recovery and Search and Rescue missions. 22 squadrons from 13 countries took part in NTM18, including Italy, Spain, Czech Republic, Netherlands, Germany, Belgium, Hungary, Switzerland, Austria, France and Great Britain. A total of 70 aircraft, 10 helicopters and an AWACS Early Warning took part in the large-scale aerial exercise, held annually with the objective of exchanging tactical knowledge and improving interoperability between various NATO and non-NATO air arms. Good to see the Germans spending money on flash paint jobs rather than addressing their many issues! If it means the Germans are learning to love Typhoon then great. So that’s their airworthy Typhoon. ? So they sent their entire operable air force then? Glad to see we don’t take part in this horse s**t. Germans are too concerned with going to competitions than they are with actual war fighting and funding their armed forces properly. Paint competitions are probably the only thing the German military is capable of winning at the moment ?